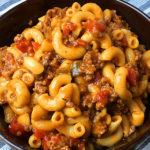 A delicious, full flavor chili mac that is easy to make and perfect for a weeknight meal for the whole family. Set Instant Pot to saute mode and add ground beef and 1/2 teaspoon of salt. Stir often until all the beef is browned. Should take about 5 minutes. Press cancel and drain fat. Sprinkle chili powder, cumin and 1/2 teaspoon salt on top of the browned meat. Then add macaroni on top (don’t stir). Add 3 1/2 cups water and make sure all macaroni is submerged. Add cans of tomato sauce and diced tomatoes right on top in the center. Do not stir! Secure lid, make sure vent is set to sealing and pressure cook (“manual” on some Instant Pots) on high for 4 minutes. When timer is complete, quick release the pressure. Remove lid and stir contents well. Everything will begin to thicken. Add 1 cup of shredded colby jack cheese and stir it in so it melts into the sauce. Serve with additional shredded cheese on top and enjoy!